One thousand nine hundred years ago on this day, only two weeks after Hadrian’s proclamation in Antioch, the new prefect of Egypt (Praefectus Aegypi), Quintus Rammius Martialis, addressed a circular letter to the strategoi of the Egyptian districts (nomes) announcing the imperial accession of Hadrian and instructing them to declare festivities for ten days. The document, written in Greek, has been preserved on papyrus (POxy 55.3781). It comes from the Oxyrhynchus Papyri Collection which comprises the papyrus texts excavated by two young Oxford scholars, Bernard Grenfell and Arthur Hunt, in the rubbish dumps outside the Graeco-Egyptian town of Oxyrhynchus in central Egypt in the late 19th and early 20th century. The manuscripts, dating from the 3rd century BC to the 7th century AD, include texts with information about the daily life and the economic affairs of the town as well as a large collection of literary works in Greek and a few in Latin. They were then brought to England and deposited in Oxford. The Egypt Exploration Society owns more than 500,000 papyrus fragments from this site which are now housed in the Sackler Library in Oxford. It is the biggest hoard of classical manuscripts in the world. After more than 100 years since their discovery, the Oxyrhynchus Papyri continue to be reconstructed from fragments and translated at Oxford University. 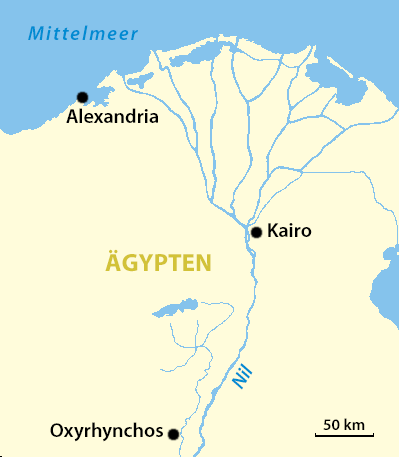 Location of Oxyrhynchos in Egypt. The ancient city of Oxyrhynchus lays on the west bank of the Bahr Yusuf (Canal of Joseph), a branch of the Nile that flows north along the western edge of the middle Nile valley. In ancient Egyptian times the town was the capital of the 19th Upper Egyptian nome 𓉋 (province) and it first appeared in hieroglyphic sources during the 25th Dynasty, or Nubian period, under its Pharaonic name Per-Medjed. After the conquest of Egypt by Alexander the Great in 332 BC, the city attracted a large number of Greek colonists who gave it the name Oxyrhynchus. Its Greek name came from the ‘sharp-nosed’ fish (Greek: oxurhunchos) which was the patron deity of the nome. In the Roman and Byzantine periods the city of Oxyrhynchus occupied an area at least 2 km long and 1.5 km wide and was adorned with fine stone public buildings (hippodrome, baths, temples), a theatre and colonnaded streets. Its population is estimated to have been around 30,000 inhabitants. Terracotta bust found of a deified Roman emperor, perhaps Hadrian. Found at Oxyrhynchus. The papyri in question is dated year “1 of Hadrian”, “2nd intercalary day” of the Egyptian month of Mesore (Alexandrian calendar), that is August 25 AD 117. The message was intended to circulate up the Nile from Alexandria to the strategoi (generals) of the Egyptian nomes, communicating instructions for the announcement of the imperial accession of Hadrian and the subsequent celebrations. 25. Aug. 117 – P.Oxy.LV 3781 – Announcement of the Accession of Hadrian. English translation of P.Oxy. 55 3781 (by J. R. Rea. 1988): Rammius Martialis to [the strategoi] of districts, greetings. With an eye to the well-being of all mankind – Know that he has taken up the leadership from the god his father: Imperator Caesar Traianus Hadrianus Optimus Augustus Germanicus Dacicus Parthicus. Vow[ing] (sacrifices) therefore to all the gods that his age-long permanence may be preserved for us, we shall wear garlands for ten days. This very thing you shall make known to the dis[trict]s under your charge. Year 1, Mesore 2nd intercalary day. (Of the) Letopolite, Memphi[te, Arsinoite,] Aphroditopolite, Heracleopolite, Oxyrhynchite, the Oasis of the Heptanomia, Cynopolite, [Herm]opolite . . . The date of the letter demonstrates that the announcement of Hadrian’s accession was rapidly transmitted to Egypt, even before the news had reached the Senate in Rome. There was great social and economic distress in the country as a result of the Jewish uprising that had ravaged Alexandria and other parts of Egypt. Hadrian had to act quickly to restore peace and order in a city and country of prime importance. The date also says a lot about his immediate decision to replace Trajan’s legate M. Rutilius Lupus with his own man Quintus Rammius Martialis who, as A. Birley notes, must surely «have been in the East with Hadrian». EGYPT, Alexandria. Hadrian. Tetradrachm. Dated RY 2 (AD 117/18). Laureate bust right, slight drapery / Agathodaimon serpent right; LB (date) and winged caduceus to left, grain ear to right. Milne 835. Coin from my private collection. As the new Praefectus Aegyti, Martialis probably travelled from Antioch to Alexandria, perhaps by sea, with Hadrian’s friend, the Greek intellectual Valerius Eudaemon. The Historia Augusta tells us that Eudaemon, who was with Hadrian in Antioch at the moment of his accession as an «accomplice in obtaining the imperial power» (conscius imperii), was then dispatched to Alexandria as procurator Augusti ad dioecesin Alexandreae, in charge of the finances of the district of Alexandria. They probably came with the letter of dismissal for the Prefect Rutilius Lupus. The document also mentions the full titulare of Hadrian on his accession: Imperator Caesar Augustus Traianus Hadrianus Optimus Germanicus Dacicus Parthicus. Another paryrus, from the archives of the Temple of Soknopaiu Nesos (stud.pal.22.183) and also dated to the first Egyptian regnal year of Hadrian (11-28 August 117), lists provisions and expenses for the celebration of a festival to Hadrian (Ἁδριανῷ η γάμοις) called ‘Hadrian’s days’ (ἡμέραις Ἁδριανῷ). Livia Capponi, in her paper Hadrian in Jerusalem and Alexandria in 117 (2010), suggests that this document «refers to the 10-day festival in honour of Hadrian that was ordered in the edict of Rammius Martialis of August 25, 117». Probably related to this festival is another fascinating papyrus dated to the same period, a libretto fragment known as P.Giss. 3. The well-preserved text, belonging to the archives of the strategist Apollonios, contains part of a dramatic performance between Apollo and the responding voice of the people. The poem was composed for the festivities at Heptakomia, the metropolis of the Egyptian nome Apollonopolites (modern-day Kom Isfaht). The god Apollo praises Trajan who has just become divine and his successor Hadrian and declares (translation of J.P. Alexander, 1938): «Having just mounted aloft with Trajan’s in my chariot of white horses, I come to you, oh people, I, Phoebus [Apollo] by no means an unknown god, to proclaim the new ruler Hadrian, who all things serve on account of his virtue and the genius of his divine father». The people respond by rejoicing: “Let us make merry, let us kindle our heart in sacrifice, let us surrender our souls to laughter». It seems that Apollonios of Heptakomia was responsible for the organisation of the celebrations. Apollonopolis Heptakomia Parpyrus – Hadrian accession as emperor. Apollonios is known to have served as a strategos (head of the civil administration) of the district Apollonopolis and was active at the time a revolt of the Jews took place in Egypt and when Hadrian succeeded Trajan as emperor. His archives which included numerous official and private papers have been preserved. Apollonius had a regular correspondence with his hometown Hermopolis where his wife Aline, his daughter Heraidous and his mother Eudaimonis lived. The documents shed some light on the uprising of the Jewish diaspora in Egypt and the impact of this war on the local population of the country in AD 116 and 117. Furniture ornament depicting a seated female figure representing the Tyche of Alexandria. Circa 330-370, found in Rome, Esquiline Hill. Livia Capponi also advances the hypothesis of a visit of Hadrian to Alexandria soon after his accession. In her opinion there is literary and especially papyrological evidence to support the emperor’s presence in Egypt in 117, including documents referring to Hadrian’s edicts and benefactions in favour of the Egyptian farmers and other categories of the local population. This was first suggested by W.D. Gray in his paper New Light from Egypt on the Early Reign of Hadrian (1923) who believed that the «Jewish war would have summoned Hadrian to Egypt, as the menace from the Roxolani summoned him later (118) to the Danube frontier». The literary evidence comes from the 4th century theologian and historian Jerome who, in his Chronicle (a translation into Latin of the Chronicon of Eusebius), mentions that Hadrian restored Alexandria after its destruction by the Jews (Adrianus Alexandriam a Judaeis subversam restauravit – Chron.197) as well as from Epiphanius’ reference to a journey made by Hadrian in Palestine and Egypt in his first year in power. On a Oxyrhynchite papyrus dated to 19 November AD 117 (SB 14.11958), Herakleides, the former gymnasiarch of Oxyrhynchus, lists the expenses incurred for the works on the temple of Artemis and states that its reconstruction began on Thoth 27 of the Year Two of Hadrian, that is 24 September 117. Other papyri, all from Apollonios’ archives at Heptakomia and dated to November 117 to January 118, demonstrate that before the end of October 117 Hadrian personally issued a series of decrees aimed at rescuing the Egyptian farmers from economic insecurity. The effect of the Jewish war upon agricultural conditions in the “granary of the Empire” necessitated a number of important measures. In P.Giss. 7, dated September 28 – October 27, Hadrian is said to have «lightened the burden of the inhabitants of the land». In P.Giss. 4 Hadrian, «along with other benefits he had conferred, had decreed that the different classes of domain land are to be taxed in accordance with their value and not according to the old decree». The new measures allowed the farmers to obtain a reduction in the price of their leases and taxes. All these decrees were very complicated, involving different classes of land (royal, state and crown) and different degrees of fertility. For this reason, both L. Capponi and W.D. Gray believe that Hadrian probably passed the edicts in person, and from Egypt. As Capponi puts it «by visiting Alexandria, perhaps Hadrian aimed to legitimise his accession to the imperial throne». Attractive as this sounds, it cannot be supported with firm evidence. For sure, Alexandria would have appealed to Hadrian. The Egyptian capital had long been the cultural heart of the Eastern Mediterranean, famous for philosophy and theoric, science and medicine, literature and poetry. What is certain however is that Hadrian was in Alexandria in AD 130. He visited the Tomb of Pompey, whose monument he restored and he also debated in the Museum (sanctuary of the Muses). He fostered the development of the Serapeum, Alexandria’s most important sanctuary, by inaugurating new architectural projects. In the enclosure of the temple of Serapis, fragments of a statue were found of a black Apis bull which Hadrian dedicated «to Serapis and the other gods whorshipped together in the same temple». Statue of the Apis Bull, erected by Hadrian in the Separeum of Alexandria. Photo taken at the Osiris : Mystères engloutis d’Egypte exhibition in Paris. Rea J. R.: The Oxyrhynchus Papyri, Vol. LV. Edited with Translations and Notes. (Graeco-Roman Memoirs, 75.) Pp. xii 259; 8 plates. London: Egypt Exploration Society, for the British Academy, 1988. Gray, William D. New Light from Egypt on the Early Reign of Hadrian. American Journal of Semitic Language and Literatures 40 (1923): 14-29. Gray, William D. The Founding of Aelia Capitolina and the Chronology of the Jewish War Under Hadrian. American Journal of Semitic Languages and Literature 39 (1923): 248-256. Fuks, Alexander. Aspects of the Jewish Revolt in A.D. 115-117. The Journal of Roman Studies, vol. 51, 1961, pp. 98–104. Alexander, Paul J. Letters and Speeches of the Emperor Hadrian. Harvard Studies in Classical Philology 49 (1939): 141-177. Birley, Anthony. Hadrian the Restless Emperor. London and New York: Routledge, 2000. Judith S. McKenzie, Sheila Gibson and A. T. Reyes, “Reconstructing the Serapeum in Alexandria from the archaeological evidence. JRS 92 (2004) 73-121. As always Carole, you deliver a very informative and interesting post and I am sure that new college students would benefit from your thoroughly researched articles. I totally echo this comment! Just when I think the latest info on Hadrian and his journeys have been uncovered, you enlighten and amplify where others give short shrift. It’s the depth and magnification you provide which never ceases to intrigue….and delight. Shall we hope for a publication once your project is completed? If that is your travels allow for such a compilation. Superb details . I enjoy reading all your writing very much .Thank you so much for sharing ! Great job. Very interesting informations. I always learn very new data of your articles. Hey, I really like the way of your narration:) Cheers!